➽Loud noises can cause permanent hearing loss and even accelerate the process of becoming deaf. Noise levels above 125 decibels for even short periods of time, can cause permanent hearing loss. When exposed to these decibels for longer periods of time the effects are even worse. Our Dr. Meter high Noise Reduction Rating (27NRR) Earmuffs are one of the best ways to protect your hearing from damage, especially perfect for kids. ➽Especially sized and designed for babies and children. 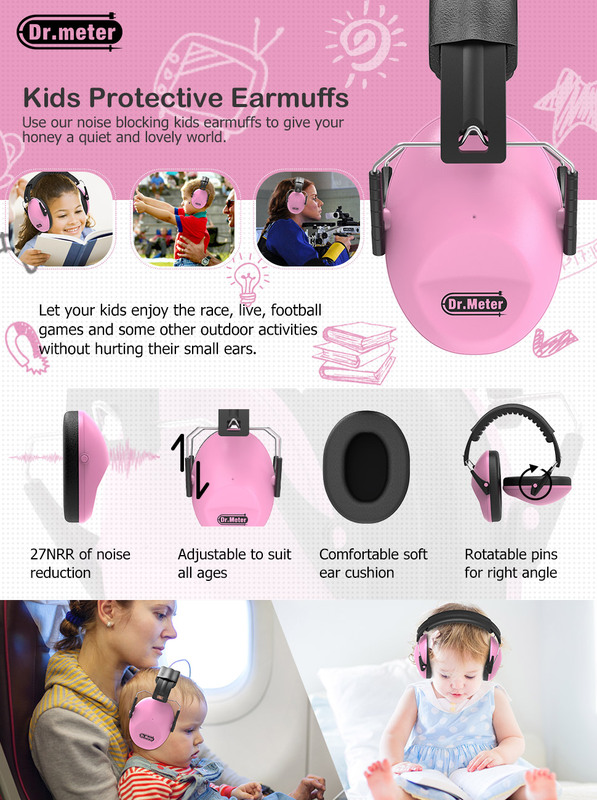 With a heavily adjustable padded headband and ear pads and a low clamping force for comfort, and with NRR 27 hearing protection, our dr.meter ear muffs are an excellent choice for protecting your child in a wide range of noisy events and situations Ideal for sleeping, studying, Shooting​.